On foreign policy, the isolationist right and the progressive left always manage to arrive at the same destination: withdrawal and isolation, ceding the world to its worst actors, ignoring small problems until they become large crises. Caroline Glick summed it up several years ago: "The far Left argues the U.S. should withdraw from world leadership because the US is evil. And the far Right argues the U.S. should withdraw from world leadership because the world is evil." 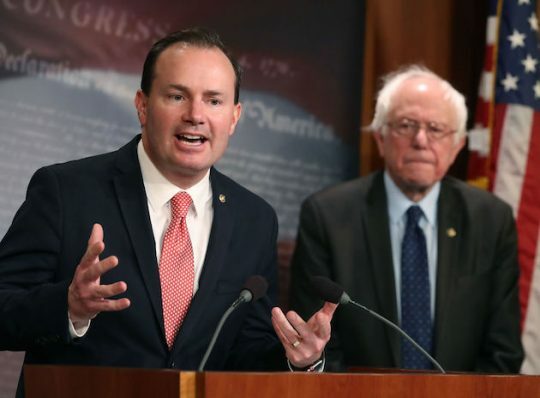 As Adam Kredo reported Tuesday, Sen. Mike Lee (R., Utah) has joined a Senate coalition of the isolationist right and the progressive left to oppose the Trump administration's policy of providing limited support to the Saudi-UAE campaign to defeat Iranian-backed rebels in Yemen. Yemen sits on the southern border of Saudi Arabia and overlooks two of the world's most important shipping lanes, the Gulf of Aden and the Red Sea. Iran is trying to embed a Hezbollah-style militia there that would turn Yemen, like Lebanon, into an Iranian satrapy. Already, the Houthi rebels–Tehran's proxies–have fired Iranian-supplied missiles at ships in international waters and at strategic targets inside Saudi Arabia. Let the Houthis take Yemen, and Iran gains yet another forward operating base from which to sow chaos and violence in the region. We and our allies will regret it for decades. This shouldn't be a hard call. And it shouldn't be a hard call for Senator Lee, either, because stopping Iran in Yemen is a legitimate foreign policy goal and the means being employed to achieve that goal are proper and well-calibrated. They consist merely of providing mid-air refueling and intelligence-sharing (to reduce civilian casualties) to Saudi Arabia and the UAE. There is no slippery slope to greater U.S. involvement. But Sen. Lee is supporting a Senate bill that would trigger the War Powers Act, a piece of legislative arcana obsessed about on the right by the kind of people who hide gold bars in their mattresses, and invoked on the left by people whose real foreign policy goal is American weakness and self-hatred. In 2008, a bipartisan commission chaired by former secretaries of state James Baker and Warren Christopher called for its repeal because "it's probably unconstitutional and has not been recognized as good law by any administration since it was passed." Writing in National Review a year ago, Berkeley law professor John Yoo wrote: "Throughout our history, neither presidents nor Congresses have acted under the belief that the Constitution requires a declaration of war before the U.S. can conduct military hostilities abroad. We have used force abroad more than 100 times but declared war in only five cases," because "our Framers decided that the president would play the leading role in matters of national security." As to the War Powers Act, passed in 1973 over President Nixon's veto, writes Yoo, "no president has ever accepted the constitutionality of its 60-day limit on the use of troops abroad. No federal court has ever upheld the resolution. Even Congress has never enforced it." In supporting the libertarian-Bernie Sanders axis, Sen. Lee is joining the jokers. If he actually believes that refueling Saudi jets is unconstitutional, he should make that case openly. If he believes the United States should allow Iran to take over Yemen so that we and our allies can repeat our bitter Hezbollah experience there, he should make that case openly. But making this debate about the War Powers Act is an evasion. It signals one's constitutional virtue while avoiding the difficult choices a superpower must confront. And circulating letters signed by a rogue's gallery of radical organizations that do not have America's best interests at heart, and do not admire our Constitution, is a mockery of some of the very things Mike Lee holds dear. This entry was posted in National Security and tagged Mike Lee, Yemen. Bookmark the permalink.